The folder containing the career chips. The Space Wasp is an unconfirmed alien species. Its name appeared written on a folder containing the career chips of the former Planet Express crew (1ACV01). Just like any other creature with a name beginning with the word space, the Space Wasp could not enter the Slurm golden bottle cap competition, as proven by a text written in AL1 (1ACV13). 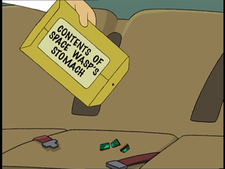 When they were writing "The Sting", the Futurama writers wanted to ensure that the continuity was kept between the Space Bees mentioned in the episode, and the Space Wasps mentioned in "Space Pilot 3000" . Unfortunately, bees and wasps are not found to co-mingle in any form, and, as such, this would be a break in continuity. However, they decided to go through it with despite their knowledge. The Space Wasp was ineligible. ^ Verrone, Patric. Commentary for "The Sting" on Volume Four, disc 3. This page was last edited on 15 October 2013, at 02:47.